A couple weekends ago Abug wanted a new book. We decided we were going to go to town and get a new book. We asked what kind of book she wanted. Her answer: A Princess Book. That day she came home with 3 books. A princess book, another book, and a Princess Cookbook. WHAT?!?! Yup, it exists. It’s called the Disney Princess Cookbook. After she picked out a few books, we went over to the cookbook section to browse. I saw this book and on the cover are three princesses. I figured it was a kids book in the wrong section, but when I picked it up, sure enough, it was a princess cookbook. I’ve always been a huge proponent of learning to cook early. I got Tbug in the kitchen with me to the point at a young age I could sit in the kitchen, and actually turn her loose. I would just monitor the recipe to make sure she didn’t forget something. Now, in this case, Abug can’t quite read yet, so I help her just a bit more. 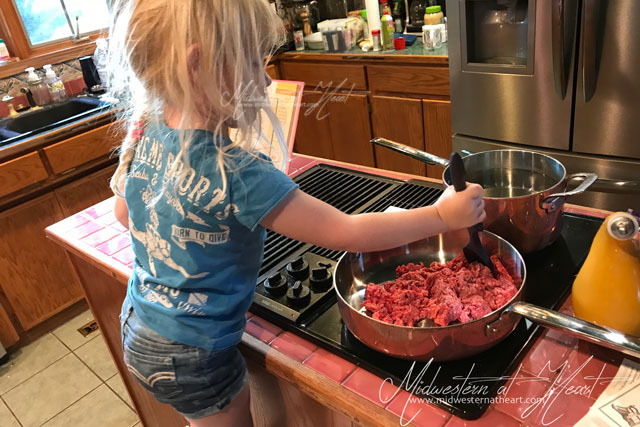 She is only 3 after all… But as a three-year-old, I have her in the kitchen working right alongside me. The week following getting her this cookbook, I was trying to decide what to make for dinner. I knew what we had in the refrigerator and the cupboard. That’s when I decided… we were going to make Gus’s Mac and Cheeseburger. This is a cookbook that is geared towards getting kids in the kitchen. It even has in the instructions, have a parent help with …… So I knew that this would work to get her into the kitchen and able to help mommy. Anytime I’m in the kitchen cooking, she wants to be right alongside me. Perfect! She did a fantastic job. She refused to try any. Rachael Ray always says that getting the kids to help cook will get them to eat. I call false on that instance. It really confused me too because she loves mac and cheese. But she’s 3. 3-year-olds don’t always eat. They’ll go days it feels like without eating and then bam, they eat all day every day. 3-year-olds are weird. This may be why I call her a threenager. I think I’ll leave it at that and know that I do feed my child. She eats. I’m not crazy… am I? Cook the macaroni according to the directions on the box. Ask an adult to help you at the stove. 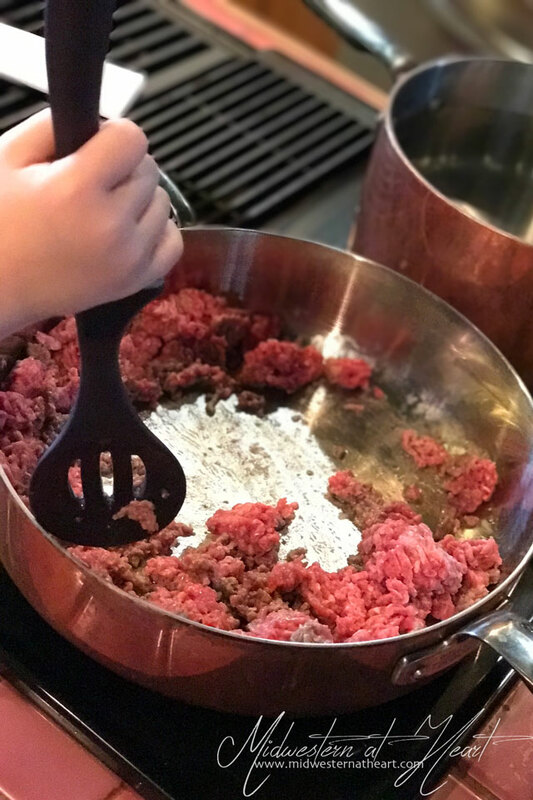 Place the ground beef in a heavy saucepan and cook over medium heat. Make sure to cook the beef until it is completely brown, then drain off any liquid. Heat the oven to 350˚F. 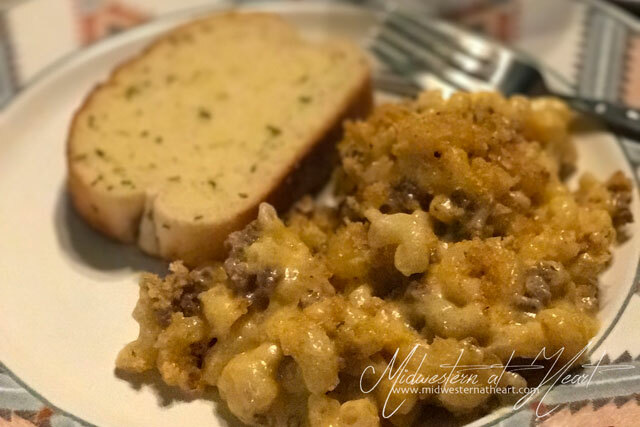 Combine the hamburger and the cooked macaroni in a 2 1/2-3qt casserole dish. Melt the 4 tbsp of butter in a heavy saucepan over medium heat. Stir the flour into the butter with a wooden spoon. 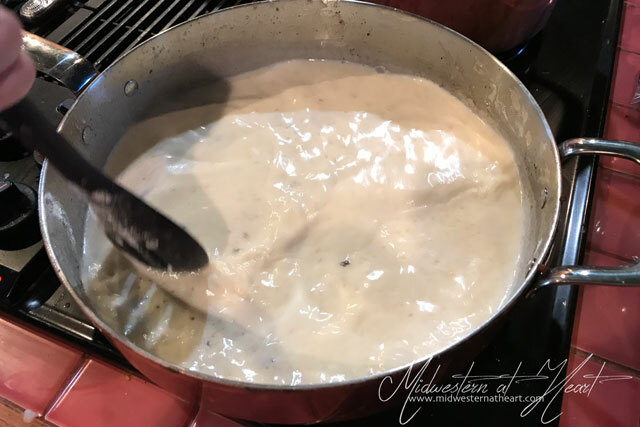 As soon as the sauce starts to bubble, add the milk, mustard, and nutmeg, and whisk until the mixture is blended. Stir in the cheese, and continue stirring until it is copletely melted and the sauce starts to thicken. 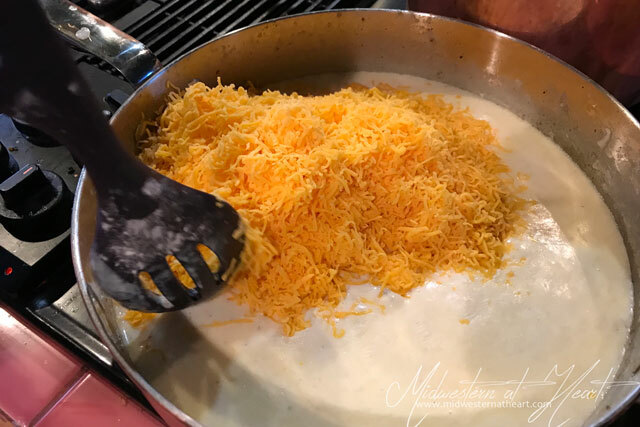 Ladel the cheese sauce into the casserole dish, and gently stir until the macaroni and hamburger are evenly coated. Mix all the topping ingredients together in a bowl and then sprinkle them on the macaroni. Ask an adult to help you with the oven. Put the casserole dish in the oven. Bake the macaroni and cheese until it heats all the way through and starts to bubble (about 20-25 minutes). That looks really good. And I think that cookbook is a great idea! Hard to believe she is three and cooking! You all have a blessed week!